ade from the finest tobacco leaves around the world, Mya Cigars are made by real Cuban "tabaqueros" in the one and only cigar factory located in West Palm Beach, FL. ince 1896, the Rodriguez Family from Cuba has made fine cigars. Trained in Cuba, Rodriguez personally hand selects all his own aged tobacco leaves. Señor Jorge "George" Rodriguez has christened the special blend after his granddaughter "Mya". his superb Cuban-seed, Dominican grown cigar tobacco is smooth to the end. This sacred combination of aged pristine tobacco with over 100 years of "Cuban Cigar" experience is what we now proudly call a "Mya". 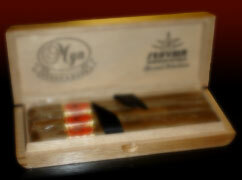 Enjoy the tradition of a Mya cigar.